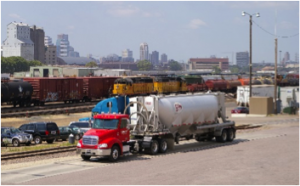 Dry Bulk – Ee-Jay Motor Transports, Inc.
We provide on track storage for over 235 jumbo railcars making us one of the largest and most experienced dry bulk handlers in the Central Midwest area. The majority of this track space is owned and maintained by Ee-Jay. 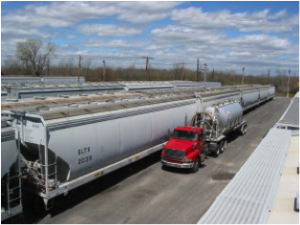 Ee-Jay's substantial fleet of large cube dry bulk aluminum pneumatic self-loading trailers are dedicated to specific commodities service. All valves and fittings are stainless steel/aluminum, all gaskets are sanitary white and trailers are equipped with inline filters and stainless steel hoses to insure product purity. 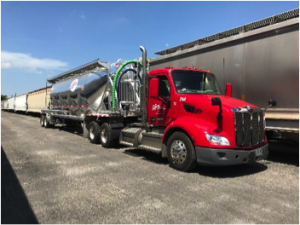 Tractor and trailer exteriors are cleaned regularly and trailer interiors, hoses, discharge line, etc., are washed with hot filtered water and cleaned as required. Because of the highly contamination prone nature of the material handled, virtually all trailers are dedicated to a specific material. Tractors are equipped with PTO-driven blowers. 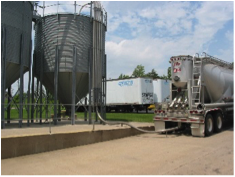 Blowers provide air for delivery of food grade material and are equipped with a filter on each side of the blower. These blower filters are regularly inspected, cleaned or replaced. 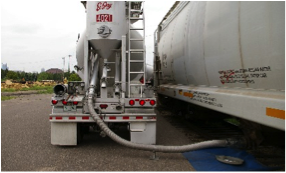 Additionally, trailers are equipped with heat exchangers to provide exact unloading air temperatures depending upon the product that is handled. 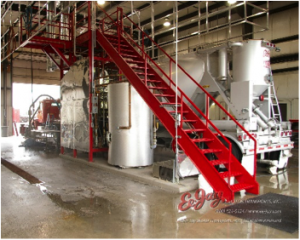 Modern two bay drive thru indoor tank wash facilities in E. St. Louis and St. Paul equipped with the most modern Gamajet trailer washing spinners, high pressure product hose and rear filter canister cleaning appliances.